This cryptic remark from future Prime Minister Rabin, when viewed in the current policies of Prime Minister Sharon and in the "New Jerusalem Covenant Project", tell us of the true plan for Israel and the Palestinians. Now, all is more clear. Events in Israel seem to be speeding toward the conclusion which Cutting Edge has envisioned for over 10 years now. A few months ago, we noted Sharon's exaggerated language against the settlers, and wrote an article explaining why he was abusing them with his rhetoric. This article is NEWS1941 and is entitled, "Is Israeli Prime Minister Sharon Using The Forced Settler Evacuation As An Excuse To Crack Down On Orthodox, Observant Jews?" Once you understand the precepts of NEWS1941, you will be better prepared for this article. However, our single most important article in understanding our teaching on the future plans the Illuminati has toward Israel and the Palestinians is NEWS1911, "Proofs of A Conspiracy: Oslo Accords Were Originally Designed In 1993 To Give Large Chunks of Israel Back To The Palestinians -- Exactly Where 'Hardliner' Sharon Is Heading Now". Please read this article thoroughly -- including the older referenced articles -- before you continue reading this one. Once you have read these older articles, you will be in position to understand the direction we are going to take you here. As we stated in NEWS1911, the people have never wanted to go where Sharon is taking them now; in fact, the electorate threw out "Liberal" Barak to bring in "Conservative, Hardliner" Sharon in order to put an end to Arafat's Intifada uprising and to his suicide bombing terrorism. During the campaign, Sharon convinced the Jews that, as a former Army General, he knew exactly how to defeat Arafat and his unending terrorism. Jewish settlers -- most of whom are religious, observant Jews -- felt more comfortable with Sharon because he had championed their cause in the distant past. Time and time again, Sharon had spoken out on behalf of the right of the Jewish people to occupy the whole land of Israel; Sharon's rhetoric stated that the settlements in the portion of Israel now primarily occupied by the Palestinians were the correct action Israel should be taking right now. Sharon firmly supported the settlements -- way back then. However, now that the time period is shortening for the final portions of Oslo to be completed, Sharon has turned 180° in the opposite direction. Israel seems to be in chaos right now, with some elements warning of a Civil War, while Sharon is using the powers of his office to severely threaten Jewish settlers. Since we know that the Illuminati strives always to "bring order out of chaos", we must carefully examine what is occurring now. Once we carefully look at all the facts, and compare them with the known Illuminati Plan, plus Bible Prophecy, you will understand what is happening and where it will probably lead. ORIGINAL LIE OF OSLO: "LAND FOR PEACE"
"The political process transpiring in the Middle East ever since the Madrid Conference (November 1991), and even more vigorously since the signing of the Oslo Accords (September 1993), is referred to by many as a 'peace process' whose essence, as characterized by the US presidents George Bush and Bill Clinton, is the principle of 'territories for peace'. In other words, it is incumbent on Israel, the sole democracy in the Semitic domain, whose area totals 1/500 of that of the Arab countries, to divest itself of the one and only commodity that it lacks, namely territory. The Arab tyrannies, on the other hand, must provide in return the sole commodity of which they have none - peace. From the standpoint of the State of Israel, peace for territory is a radical move that is liable to place the Jewish state on the verge of existential danger, since withdrawal to the 1967 borders or to a line proximate to them will return Israel to the situation from which it was forced to stage a preemptive war so as to liberate itself from the 'Auschwitz borders' as Abba Eban characterized them at the time. Today, however, the situation is far more grave than on the eve of the Six Day War ..."
From the beginning of the Oslo Accords (1992-1993), I was perplexed, for its foundational precepts and assumptions simply did not square with reality. How could Israel -- one of the tiniest nations on earth who is daily engaged in a fight for survival against an enemy who outnumbers her 50 to 1 -- agree to give up even one inch of her territory? I well remember the exclamation of former President Nixon, who stated after leaving office that Israel could never agree to give up part of her territory to the Palestinians, for the existence of of such a hostile state within her borders would be identical to a man have a sharp knife pressed against his chest. Further, the very nature of the Islamic enemy is such that her adherents will never know peace, at least not until all her enemies throughout the world are either dead or "converted" to Islam at the point of the sword. Time and time again, the Palestinians have publicly called for a "Day of Rage" in which they rail against Israel's policies, or against specific events. The entire religion of Islam historically has been one of blood spilt of all her enemies, most particularly the Jews and the Christians. Finally, Arafat has always boasted that he would consider any agreement under Oslo to be merely "temporary" and to be a springboard by which he shall ultimately destroy the Jewish state and force all its citizens to "drink of the Mediterranean" -- a euphemism which literally means the annihilation of all Jews. The Palestinians do not want 42% of Israel on which to build their country; they want 100% of Israel, on which they will build their Palestinian State. Oh, yes, and Jerusalem is planned to fall totally in the hands of the Palestinians. Knowing all this, and knowing that Israel's leaders know all this, it makes no sense whatsoever for the combined "Liberal" and "Conservative" governments since September, 1993, to proceed with a seemingly insane offer to give the Palestinians so much of Israel that her military can no longer adequately protect her. Since no one has ever accused any of Israel's leaders with stupidity, and since we know the Illuminati for whom Israel's leaders work, really and truly wants to rebuild Solomon's Temple on the ancient Temple Mount (NEWS1643), we can be fairly certain that, whatever the real plan truly is, it does not entail the complete loss of the nation of Israel. Therefore, before we go any further, let us reiterate that the Illuminati cannot take any action which will cause the annihilation of Israel. Remember, without Israel, the Illuminati can not rebuild their Solomon's Temple, nor stage their Christ to take control of the largely Old Testament system of Freemasonry. If Israel were to cease to exist, the Illuminati global plan would be stopped in its tracks. * Whenever the Bible portrays an angelic being as having to "stand", it means that the being is called into action. Thus, at the "time of the end", the situation in Israel will deteriorate to the point where the Arch-Angel Michael is going to have to "arise" to defend "Daniel's people", the Jews. * "But at that time your people shall be delivered" -- Just as Amos declared, above, God will guarantee Israel's survival. She may be badly damaged, but she will survive. Let us examine some other passages which talk of unprecedented disaster for Israel during this time -- however none of the disasters will result in Israel's actual national demise. Notice that Jerusalem will be attacked by an army from "a heathen, hostile people numerous and mighty, the like of which has never been before and shall not be again even to the years of many generations." In all these passages, God foretells that He will cause Israel to go through unprecedented terror and trouble -- but shall not be destroyed. Since God's prophecy requires Antichrist to rebuild the Temple so he can profane it, God will Personally take care to ensure that Israel is not destroyed. She may be terribly devastated, but she cannot be destroyed. Therefore, with these concepts in mind, let us now go to the current situation, where Ariel Sharon is about to carry out one of the more painful parts of the Oslo "Peace" Accord -- unilateral withdrawal of all settlers from the territories (See NEWS1911). Before we get started, please allow me to explain these two maps. 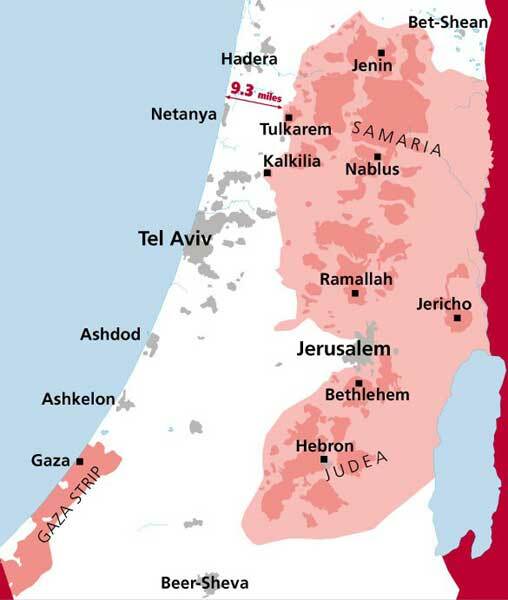 The red and white map at the far left depicts the areas known as Judea, Samaria, and the Gaza Strip. The white section is Israel and is primarily Jewish; the red section depicts the Palestinian areas of population concentration in these three areas. When you mesh these two maps, you will see that the Jewish people live primarily in the white areas while the Palestinians live primarily in the red shaded areas of Judea, Samarra and the Gaza Strip. The only Jews now living in the primarily Palestinian area are the Jewish settlers. 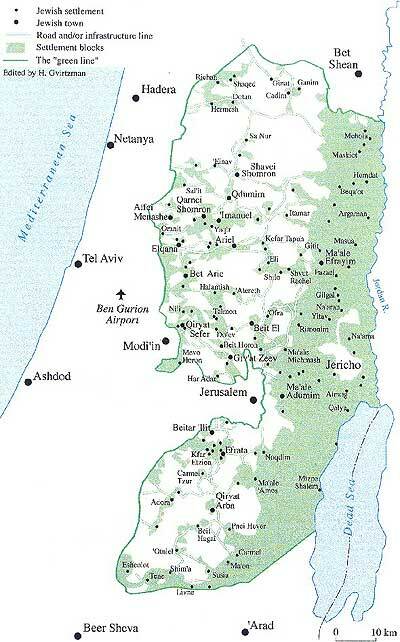 In the map on the right, the Jewish settlements which Sharon is now determined to remove are depicted as black dots. These settlers are primarily observant Jews who have taken the physical risk of helping to build a Jewish settlement in the heart of the Palestinian population. These settlers are willing to place their lives on the line because they literally believe in the Torah, in all the Messianic prophecies, and in the End of the Age prophecies which foretell that, when God establishes Israel again, He shall not only guarantee her survival, but He shall expand her territory to include all the land He promised Abraham (Psalm 89:25). This expanded territory includes Syria up to just south of Damascus, all of Lebanon, most of Jordan (Edom and Moab) and part of Iraq. These settlers believe G-d has given Israel this land and they are willing to do their part to see that this prophecy is completely fulfilled. Until the time comes when the Muslims are expelled from Israel, these religious Jews are willing to occupy land, build settlements, and risk their lives. This is their religious duty. And, current Israeli leadership hates these religious Jews exceedingly. Their vision is that of a completely secular Israel, a land which they plan to rename "Palestine", thus cutting the land and the people from their ancient Biblical roots. Remember this fact, for we shall come back to it at the end of the article. Now, let us review the dictatorial policies with which Sharon is threatening these primarily religious settlers. "A review of the proposed Disengagement Plan Law presented today in Hebrew on the Ministry of Justice website ... finds that Article 27 (A)(2) provides for the imprisonment for five years of residents of communities who decline to leave their homes before the evacuation date. Those residents who have no knives (possibly even no kitchen knives) or guns in their possession who decline to leave their homes before the evacuation date could be imprisoned for 3 years. It is important to note that this punishment could also apply to residents who as an act of passive resistance, lay on the floor of their home and require that security forces carry them out [Article 27(A)(3)]"
If an American President who is not facing a dire national emergency were to create a law such as this, imprisoning Americans who just did not want to leave their homes and their private property, so many Americans would protest so vehemently that widespread mayhem would erupt. Here, Sharon is acting as a dictator, having decided that the settlements which he backed so many years ago are now not worthy of government protection, and indeed, are so dangerous that they must be uprooted and their citizens relocated. Since Sharon realizes the type of protest he will be facing from these settlers is rooted deeply in religious conviction, he has decided to get really, really tough with those who resist. 1. Labels are meaningless. The men behind opposing labels are equally committed to this coming global system. 2. The Illuminati continues to show great skill in getting equally committed men on both sides of every issue. When Satan wants a man in a particular position, he gets him, unless God stretches forth His Omnipotent hand to prevent it. At this End of the Age, as the Holy Spirit is steadily withdrawing His restraining power (2 Thess 2), Satan is most often getting both his way and his men in power. Since present-day Israel is the properly constituted authority, it is treasonous in the highest degree for Prime Minister Sharon to carry out a secret plan which will dismantle the current Israel in a pool of blood so that a radically different -- secular -- "Palestine" can be erected on the ruins. Now, let us return to our featured GAMLA article for more information which we can use to gain more insights. Just like that, a person who naturally does not want to be uprooted from a settlement into which he and his father have poured years of blood, sweat, and tears will refuse compensation of any amount. This land on which he is living is the eternal Israel to which observant Jews have yearned for 2,000 years to return. Now that the miracle of Israel's rebirth has occurred 56 years ago, the settler is unwilling to leave voluntarily. Therefore, Sharon is threatening them with 3-5 years of jail and a loss of their private property after the date of the evacuation. The price is steep, Sharon and his ministers are adamant, and some of the settlers are talking civil war. "Leaders of the Settlers’ Council have once again used the threat of civil war ahead of the expected withdrawal from the Gaza Strip and northern Samaria under the framework of the disengagement plan. During a meeting with Public Security Minister Gideon Ezra held on Monday, the settlers told him, 'Wake up, we are nearing civil war. A plebiscite is in order'." These settlers are convinced that Jewish citizens in all of Israel would reject Sharon's unilateral withdrawal proposal if they just had an opportunity to vote on the issue. Hence, settler leadership is pushing for a national referendum at all costs. Supposedly, if they lost the election, they would meekly accept the withdrawal, a supposition which may not be entirely true. Nevertheless, settler leadership is pushing for a national vote with all their strength. If they do not get such a referendum, they are hinting at a "civil war", which means they intend to take up arms against the State. Perhaps this is the reason Sharon decided to have the Israeli Defense Force (IDF) carry out the forcible evacuation and the reason Sharon decided to commit 112,500 troops to the evacuation of only 8,500 settlers. In order to soothe relations between his government and the settlers, Sharon took two steps which I am sure he considered brilliant at the time. First, he hired a religious, observant Jew to head up his expulsion campaign. From the Nazi occupation of Europe, mankind coined a new term for collaborator with a sworn enemy: "quisling", from the name of Abraham Lauritz Jonsson who collaborated with Hitler to govern Norway during the Nazi occupation. As we review the news story of this religious Jew who agreed to serve as Sharon's minister of evacuation.
" 'For a Torah Jew to voluntarily accept the mission of uprooting Jews from the Land of Israel and of expelling Jews from their homes - this is an abomination and an unforgivable desecration of G-d's Name! There can be no rationalization for this kind of immorality, no mitigating factors, no justification for a Torah Jew to willingly take on such an inherently evil task!" This statement from "one Jonathan to another" succinctly places this entire matter in perspective. From it, we see how the religious Jews really feel about an observant Jew actually enabling Sharon to evict other religious Jews from the settlements, and from it, we see the precise rationale upon which the settlers are basing their arguments against evacuating their settlements. Truly, the settlers are viewing Yonatan Bassi as a "quisling", a collaborator with the enemy. Secondly, Sharon decided to have his Evacuation Authority planned to send out a nice letter to the settlers who were about to lose their homes and their communities. Perhaps the Prime Minister forgot that religiously observant Jews remember recent Jewish history. You see, the Nazis sent out just such a nice letter to the Jewish communities telling them why the were about to be uprooted; of course, the letter did not mention that Hitler's ultimate goal was to annihilate the Jewish race. "Last week I sent a letter to the head of the Deportation Administration, Mr. Yonatan Bassi, in which I wrote that the fact that he plans to send a personal letter to each of the inhabitants of Gush Katif designated for transfer, and that his letter contains a "personal appeal and initial explanation of the evacuation process," fills me with chilling associations from the Holocaust. I attached to my letter one that had been written by the Berlin Judenrat in 1942 to the Jewish community, with details and explanations of the approaching deportation. I wrote to Bassi that, in my opinion, the document from 1942 was chillingly similar to the letter that he was about to send." Apparently, Nadia received an advance copy of the planned letter, and was reacting to its contents. Even though I diligently searched the Internet for a copy of one of the Nazi letters to the Judenrat, I could not find one. However, the very idea that Sharon could be planning a Nazi-like forced evacuation of Jewish citizens from their homes is unbelievable; Sharon then picked a Jewish collaborator to aid him in his plan, also chillingly similar to the Jews who collaborated with the Nazis, exchanging their management ability for their lives; but the idea that Sharon would plan to send a nice letter to every settler, apparently designed like the nice Nazi letters to the Judenrat, is simply astounding! But, why should we be too surprised? We have repeatedly stated that the current Israeli leadership is not truly Jewish, but Illuminati -- as the symbol of the blue hexagram on a white field clearly demonstrates. Since Anti-Semitism is rampant today, since many Jews equate any criticism of current Israeli leadership with Anti-Semitism, and since so many people are unfamiliar enough with prophecy to be able to properly understand the plans God has for the current leadership, please take a moment to read our article on this most important subject, NEWS2128, "American Jewish Citizen Outraged That President Bush Positioned Himself In Front of the Illuminist Protocols of Zion Symbol, The Israeli Flag!" Ariel Sharon and his entire leadership, Shimon Peres and his entire leadership, and many other key politicians in Israel are not Jews in God's eyes. While we know they are Illuminati through and through, Jesus described them in another way. This symbol is proof positive that the current Israel of today is Illuminist through and through. Mayor Amschel Bauer (changed later to Rothschild) adopted the hexagram as his symbol in the early 1770's, and it has remained their symbol ever since. Because Rothschild financially backed the early Zionist movement, he was able to force acceptance of this evil symbol as the national symbol of Israel. All leaders since 1948 have been Illuminist. 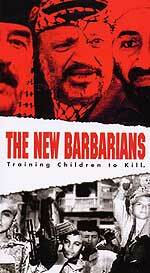 God plans to "cut off" (kill) these false Jews just as He foretold in Zechariah 13:8. But, righteous Jews who love God, take heart, for God knows those Jews who are truly His, and right now, He is marking out a Remnant for His Name, just as Zechariah 13:9 states. With the concept that Sharon and Peres intend to "ruin" the current Israel to the point where religious Jews are obliterated, but not so completely destroyed to prevent them from building a new secular nation called "Palestine", let us now see how God is going to carry out Zechariah 13:8-9. Notice the words of national distress in this Scripture. But, the worst news is yet to come! While the religiously observant Jewish settlers are agonizing over Sharon's plan to forcibly remove them from the land without compensation if they resist, Sharon seems to be prepared to give away Israel's ultimate "fail-safe" weapon -- her nuclear arsenal. "Mohammed El Baradei, the chief Nuclear Watchdog for the United Nations International Atomic Energy Agency met with Prime Minister Ariel Sharon today (Thursday). El Baradei claimed Sharon agreed to make Israel into a nuclear-free zone as a later stage of the so-called Road Map. 'The prime minister this morning affirmed to me that Israel's policy [is] that in the context of peace, establishment of peace in the Middle East, Israel will be looking for establishment of a nuclear-free zone in the Middle East', El Baradei said." Undoubtedly, the genuinely Conservative Jewish citizen is having apoplexy, for Sharon is telling the inept United Nations atomic watchdog organization that he will give up Israel's nuclear weapons if the Arabs -- who do not want peace with Israel -- will only offer them "peace". The case can be made that Sharon is just offering something he knows he will never have to actually give, because he knows the Arabs will never carry out the provisions of the Road Map. However, once an offer like this is placed on the table for whatever reason, the proposal seems to gain a life of its own, until the point is eventually reached where the concession will be demanded, even if the original premise is never met. For this reason, discerning Jewish citizens have got to be absolutely up in arms, convinced that Israel's collective leadership over the past 20 years has been consumed with a national death wish, with Sharon just the latest casualty. Certainly, this is the view of Jewish author, Barry Chamish. He believes that, since the Illuminist leaders of Israel cannot get the secular nation they desire, they are willing to completely destroy it. Chamish believes they are willing to allow Israel's enemies to take control of the land God promised to Abraham's descendents forever if they cannot get the kind of un-religious, secular nation they desire. We believe Chamish is just mostly right, as we explain below. However, Mr. Chamish would do well to remember a couple of Godly promises before he jumps to the conclusion that the current Israeli leadership is going to deliberately drive Israel into the position where she can be overwhelmed by her Arab enemies. Israel does not belong to this current Illuminist leadership; she belongs to God. All Anti-Semitic people need to pause to carefully consider their predicament; they are hating the very cause of Zion, even though Omnipotent God "dwells in Zion" forever. Before you side with the Palestinians in this current struggle, carefully read Joel 3, which describes God's furious judgment of war upon all the peoples who have mistreated the Jew. I know Israel is guilty of some war crime activity, but the Biblical truth cannot be ignored: God is watching over Israel and will deliver a physical, annihilating judgment against all peoples who mistreat her, exactly as Joel 3 foretells. Did you catch the title God gave Himself? "I, the Lord, am its Keeper" -- "... lest anyone harm it, I guard and keep it night and day." Israel is today between the two parts of this prophecy. While God has restored Israel to her ancient land, He has not yet poured out His Holy Spirit into the hearts of His people. Since the Holy Spirit testifies of Jesus (John 15:26), we know that Israel will not receive God's prophesied Spirit until her inhabitants receive Jesus as their Lord and Savior. This redeemed, saved Jew will constitute the one-third remnant (Zechariah 13:9) whom God will protect and redeem. This is the remnant who shall "look upon Me whom they have pierced" (Zechariah 12:10b) when Jesus finally returns after the 7-year Tribulation. "For the Lord your God is a merciful God; He will not fail you or destroy you or forget the covenant of your fathers, which He swore to them." (Deut. 4:31) If God allows Israel to be destroyed, His eternal promise to Abraham (Genesis 13:14) would fail, and God would be proven to be liar. We could go on and on, showing you verses demonstrating that God owns Israel and that God gave the land eternally to the descendents of Abraham. The Illuminati might control Israel right now, but they do not control Israel ultimately. When the World War III begins that is designed to be the Final Birth Pangs (Matthew 24:6-8) that will produce Antichrist (NEWS1056), God's prophecies will take over, no matter what the Illuminati has in mind. Israel will go through unprecedented national distress, and she may suffer greatly, but God will ultimately deliver her inhabitants. Let us now go back to Rabin's statement in 1979, quoted at the top of this article, for when we examine it carefully, in light of prophecy and knowledge of the Illuminati Plan, we believe you will understand the ultimate goal of the Illuminati in the current events of Israel; and, you will discover that their plan may fulfill prophecy. The first fact I want you to notice is that Rabin is speaking of two entities here, not one, even though their names are similar. * "Secular, democratic Palestine" has to be Jewish, especially since Rabin foresees that is has arisen on the "ruins of the State of Israel". * A Palestinian State is the term currently being used to refer to a potential nation comprised of Palestinians living in Israel's West Bank. In fact, in June, 2003, President Bush and Prime Minister Sharon met with the "Prime Minister" of the Palestinians to declare their common goal of a Palestinian State which would arise out of the "peace process" then ongoing (NEWS1819). American/Israeli/Palestinian diplomacy has been geared toward the eventual establishment of a Palestinian State within the current borders of tiny Israel since September 13, 1993, when Rabin and Arafat signed Oslo Accords with a beaming President Clinton looking on. The second fact you need to ponder carefully is the information Rabin is packing into these two sentences. A. This "Secular, democratic Palestine" is conceived to be coming out of the ashes of current Israel. At first blush, you might be confused, thinking that "Palestine" and "Israel" are the same entity. However, in the thinking of the secular, Illuminist leadership in Israel, they are most definitely NOT the same entity. 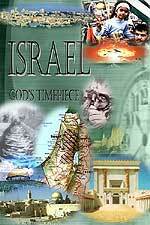 The term, "Israel" is the ancient Biblical term for God's Chosen Land for His Chosen People (Genesis 32:24). God changed Jacob's name for a very special reason: Jacob possessed enough courage and fortitude to physically wrestle with an angel all night long! Jacob, whose name was changed to Israel, was renamed because of his courage before an angel of God. "Israel" is a Biblical name. However, the main point of Joel 3:4 is that this one mention of "Palestine" occurs in passage foretelling an End of the Age judgment upon the enemies of Israel! God is saying that, after he brings Israel back to her land and reverses her captivity, He shall begin to bring all of Israel's enemies into the "Valley of Jehoshaphat" (Middle East) where He shall begin to annihilate them through war. Now notice that Rabin is saying that this new "Palestine" shall be a secular nation -- not religiously observant -- and that it shall replace a ruined Israel! Rabin's exact words were: " 'Secular, democratic Palestine' will rise upon the ruins of the State of Israel"
Now, how is it that a future Prime Minister of Israel foresees, in 1979, that present-day Israel shall be reduced to "ruins", upon which this new secular nation shall arise. In 1979, Israel was well on her way to becoming the superpower of the Middle East. Her fields, which had been desert, were in bloom with a wonderful array of produce. Israeli scientists and businessmen were working hard and effectively to raise Israel's standard of living to a level akin to that of Europe and the United States. The Israeli Armed forces were already the envy of the world. In 1979, Israel certainly did not look like a nation headed for "ruin". Then, Rabin went on to describe the Palestinian State. Rather than speaking kindly of a Muslim Palestinian State, Rabin spoke despairingly against it. He seemed to say that, if such a state were created, its very existence would spark a war between the Arabs! How can this be? If you read NEWS1057, "Next Arab-Israeli War -- Pike's Third World War Planned To Produce Antichrist - Part 2 of 2", you will find a Pentagon report to the Congress of the next Arab-Israeli War. This report stated that no one, even Arab leaders of other states, wanted a Palestinian State. Listen to a pertinent quote from this Cutting Edge article, written in 1997. "As Saddam gassed the Kurds and the Iranians, so too the Palestinian Arabs will killed off by their brethren, both east and west of the Jordan River. Arafat may already know something of this. In Gaza, he is building bunkers encased in concrete that are four stories deep in rock." The Palestinians are reviled amongst all other Arabs in the Middle East. They are considered as wild men, free booting, and absolutely ruthless. Their word is considered worthless, even amongst the other Muslims in the region. No Arab leader wants the Palestinians to be able to organize a state, where they would be able to amass resources only available to organized nations. Thus did Rabin predict that the establishment of a Palestinian State would draw the Arabs into a regional war. Rabin was not specific as to how this prosperous, powerful nation called "Israel" could be ruined in just a couple of decades. However, many are calling Sharon's Unilateral Withdrawal plan "ruinous" to the nation, and they may be right. The collective leadership from Rabin in 1993 to the present-day Sharon has certainly led Israel into a series of "painful concessions for peace", which might result in Israel's ruin. As we unfold this plan which the Illuminati is following, you will see that the goal seems to be to destroy the current nation of Israel so that a new, completely secular nation can arise on its ashes. Since the occult plan to change the world so their Masonic Christ may appear revolves around "Controlled Conflict producing a Controlled Change", perhaps the plan here is to manage a "Controlled Destruction" which would also destroy the hated religious Jew. In this context, one can understand why neither the Barak nor the Sharon government stopped Arafat's workers from digging underneath the Temple Mount and destroying all ancient Judaic artifacts they unearthed. Perhaps the secular, Illuminist government of Israel is just as interested as the Palestinians in wiping out all evidence of an ancient Judaism. This new Israel will also not have to contend with those pesky Palestinians. During the "ruinous" war (the spark for World War III) between Israel on the one side and the combined forces of the Palestinians, Syrians, Egyptians, and Jordanians, the Palestinians will be annihilated in fulfillment of Obadiah 15-18 and Isaiah 34, Damascus will be destroyed in fulfillment of Isaiah 17:1, Egypt will fall according to Isaiah 19:1, the Jordanian province of Edom will be destroyed in fulfillment of Isaiah 16 and Isaiah 34, while the Jordanian province of Moab will be destroyed in fulfillment of Isaiah 15 and Isaiah 34. Israel will emerge triumphant from this war, but may be so destroyed that she lies in ruins. Will she then be secular, having destroyed the power of the religious, observant Jews? Will her new leaders rename her "Palestine"? We can only wait to see. But, thanks to this cryptic revelation from Yitzhak Rabin, we can now understand why Sharon is getting so terribly tough on the primarily religious Jewish settlers. In the long run, these religious zealots must be defeated and their power and influence over the nation eliminated. As you watch the spectacle of the specially-trained IDF carting off resistant settlers, and when you hear of settlers being sentenced to five years in prison, you will now know why the Illuminist government of Sharon is forcing this possibly ruinous confrontation. If a civil war does erupt, and if Sharon deals terribly with the settlers, Israel might become so divided that Arafat and the leaders of the Arab coalition mentioned above, might feel the opportunity is ripe to begin their assault as the Pentagon document in NEWS1057 describes. The confrontation which results might annihilate the Arab enemies as prophecy dictates, and it might "ruin" the current nation of Israel so a secular nation called "Palestine" can arise. 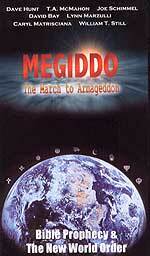 But one fact will remain: God's prophecies will not allow the Jewish people to be thrown out of the land God gave them. The archangel Michael will rise to defend the nation. But, events will be terrible -- unprecedentedly terrible.